I’ve used this shoes for less than 5 months, and already the sole of my left shoe is separating from the rest of the shoe. It’s really disappointing. I’ve had Nike’s before and never happened, not even after many years. I want to think it was just this pair that was defective because the use was pretty normal (3 days a week or less). I would have expect them to last more, especially with the use I give them. Other than that, they run small but after seizing up they fit perfectly, very comfortable and stylish. Looks great on feet! Pretty comfortable after I wore them all day. First time I wore them they did feel a bit tight and bugged my toe but once I broke them in, they felt great! 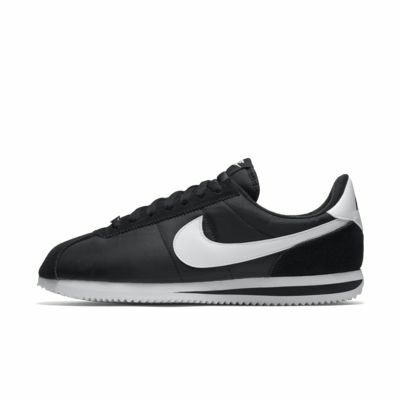 The sizing of the cortez is very different from other Nike models. You need to size up 0.5 inches if YOU HAVE WIDE FEET. I am 10.5 in Nike Flyknit Air Max, so I ordered a 10.5 in cortez. It literally burned my feet since my toes were jammed to the front of the shoe. I tried to break it in for 2 hours and I gave up. There was no way that I can stretch that by wearing. My toes were all red! So i had to return the size 10.5 and order the size 11. Always look at: https://www.nike.com/us/en_us/sfg/mens-shoe-sizing-chart the heel-to-toe between a size 10.5 and an 11 is only 1/8 inch.